– Celebrating Mandela Day 2014 (and beyond)! Imagine a world where we saw each other for more than who we appear to be and where we are from, that we all have long, difficult journeys, countless mixed ancestors living, struggling, fighting, giving, procreating, so that millions of combinations later, we are here, breathing, alive. We are our Ancestors’ wildest dreams and we will live through our descendants. Give thanks! Makhosi! When learning isiXhosa as an adult, or any language for that matter…. you need to develop a love for the spoken language and the people who speak it…. you need to gain confidence rapidly to enjoy interacting with Xhosa speakers in their language…. So leave more tricky learning and grammar (like the noun groups) for a bit later! The brain prioritises absorbing and remembering things it uses. If it doesn’t see immediate practical application, it will delegate brain power to other distractions and demands, and boy do we have lots of those in modern society! We have a number of innovative Free online Xhosa options for you to learn isiXhosa on social media platforms. 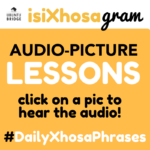 Follow us on Instagram @isiXhosa_gram to find numerous audio-pictures, which if you start at the beginning will teach you how to read and pronounce basic conversational Xhosa in an intuitive and practical way! Head over to MEMRISE and complete a course put together by one of our ex-students, using our audio and printed materials. As always we seek to bring out inspiring and empowering video content on our YOUTUBE channel. Make sure to click the red subscribe button and the little bell next to it for notifications of new videos! If you are really adventurous, you can also learn via the lyrics in Quite a White Ou’s music videos. You are also welcome to subscribe below for all sorts of other free lessons, giveaways and opportunities to learn and have fun, whilst building a more united South Africa, and a more integrated You. INTSWEMPU! (AWESOME!) & CAMAGU MAKHOSI! Thanks for your patience, interest and support! We have no sponsors and your purchases support us to keep creating new materials and inspiring content, so please do join a course, purchase our online download packages or register for an online video course. 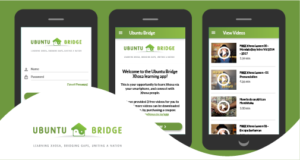 You can also invite UBuntu Bridge to come give motivational talks at your school / company / organisation / club, or to facilitate cross-cultural language experiences, team-building workshops and much more! Thanks Eduan, yho, its a lot of work, but we got such a cool vision, hope to bring it soon!!! Hi guys. Super excited about getting started . However I subscribed but i never received an email from you guys.. i ve checked my spam box and i didnt get an email. Please help..
We changed from Graphicmail (free service) to Mailchimp (paid service) and the service has been MUCH more reliable! But check your spam and archive folders and email us if a mail goes missing. I fill out everything but it won’t sign me up. What do I do? Not sure, man! It works for most people. where does it stop working? I am sooo excited, I could burst! Thank you so much for offering it for free. I have been reading through your website and I have found your story and your mission extremely inspiring. Respect man. I too believe in the power and value of Ubuntu and the unifying ability of language and common understanding. I am very excited about learning Xhosa so that I can communicate and connect with more South Africans. And to make fun of other white people and they won’t even know it hahaha! Looking forward to checking out the course! Besikipha Madala! Hambela Phabili into the Future ! The umcedo will be much appreciated . I have been practicing what I have learnt on unsuspecting people and it really does make a difference for the better, breaking the stereotypes that have formed in this country. A little effort goes along way… Sondela 4th of July . Intswempu! Ndiyavuya kakuhlo! 😉 I always love your videos! Greetings from Germany! Danke schoen, Ich bin in Munchen yetst! Looking forward to it! Spreading the word! I’d love to learn to say ‘I’m learning isiXhosa’ so that when I say ‘Uxolo Mama’ to a lady in the supermarket and she rattles off a long reply (true story), I can say I’m just learning, be patient please! That’s what we teach Molly! Great! So excited! I’m a student in Johannesburg and have been looking for a while for an isiXhosa class online so I can continue learning as I travel! It would be so great to get a better understanding of the tense and noun class structure … Thanks Ubuntu Bridge, good luck! Greatly looking forward to being able to communicate with some of the special people in my life in ‘their’ language. Really looking forward to gain the opportunity break down some barriers. Would be nice to have some recommendations included on how to, after and during the course, continue growing in our understanding of the isiXhosa language and both the traditional and modern Xhosa culture. For sure Vincent, nice one! Molo, ndifuna ukufunda isiXhosa nawe! Andinexesha ukufunda kwa-Newlands, so enkosi ukufaka iiklasi online. Ndifun’ukufunda ukutheta ku-amamama about abantwana. Ndifun’ukuconnect kwa-amamama. (ku-bamama?) Ndinomhlobo who is a mama ekhayelitsha. Siyakhula iintyantyambo kwendlu wakhe. Hayi, uyakhula, nam ndibona. Also ndifun’ukuthetha kwamaXhosa about ipolitiki. Ndinomhlobo, uvela ku-East London, utitshalakazi. Siyathetha ipolitiki sonke. Nantso ke sisi. Uqhubeke phambili! Cool, Comien. This will be a great start! I can’t get the subscription thingy open. Hi, I’m really excited about some online xhosa help – that some of it will be free is amazing! I’m volunteering at a children’s hospital and this will make communicating with mothers, children & hospital staff so much easier! can’t wait! Thank you! It will def help!! Keep up the good work! Been teaching young kids in Masi for three years now and just come back from a Wild Coast Meander. It’s really time I commit to learning this language! Sure Titia, good on you, give it a go with these lessons! Baie dankie, dit is regtig moer gaaf van julle om dit verniet aan te bied. Ek waardeer dit, ek wens meer mense in Suid Afrika het julle houding en gesindheid. Ukosi Kakhule! iFunda iteta isiXhosa. Teta kancene, kancene. Sikhona wena. LOL! Ok I am still trying, my problem is, I forget so quickly! But yeah, you will start remembering when using it a lot, so just keep with these vids and relax and enjoy the learning!!! Oops! I just checked my account and found I was signed up for only one of the newsletters instead of all three. I have now corrected the problem and alerted my cousin. In the meantime, I will wait to see what happens. I cannot wait to start the coarse!! Thanks for this opportunity guys!! What an awesome idea! I have been trudging along on my own trying to learn Xhosa, and I have managed to learn some things, but I am really looking forward to increasing my vocabulary, and becoming more confident in my pronunciation. Thank you so much for this! I can’t wait to start! Thanks for honoring Tata Madiba in the spirit of Ubuntu. I’m from Kenya and my husband is Xhosa so learning his mother tongue will be such a bonus especially when my kids and I can communicate with his family in the Eastern Cape. Keep up the good work. Thanks so much for the opportunity. Looking forward to the course! Also appreciate that it’s flexible timewise. Stoked to hear, Sharon! Hope its what you want! I’m really excited to use this to learn isiXhosa, but I’m waiting for the “getting started” email. I’ve only received an email saying “thank you for your enquiry”. I’ve checked my spam mailbox. I subscribed to all 3 items, but I’m still waiting for the “getting started” email. I’ve only received an email saying thank you for your enquiry. Please advise where do I go from here? Hi Marcelle, I think you need to check your SPAM box, as there should be an opt-in email which requires a link to be clicked, and one with a Start Course Now button. Hope you come right! Hi Marcelle, I think you need to check your SPAM box, as there should be an opt-in email which requires a link to be clicked, and one with a Start Course Now button. Hope you come right, and let me know if not! Hope you received other responses about checking your SPAM box? You are in the right place to start! Excited to start this journey. Do you guys have any suggested reading to learn more about the culture and practices of the isiXhosa people? Thank you for this platform! So many which are hard to track down, but anything you google or can find anywhere. Mostert’s Frontiers is prob the best from historical perspective POV. How long after receiving the “Thank you for your enquiry” email can I expect to get started on the course, I’ve checked my spam folder but nothing yet. Thanks! Im looking into why some people don’t receive it! really want to get started on being able to communicate with my patients. Many thanks! I used to be fluent in Zulu when I was very young, so I am confident that I will learn Xhosa very quickly. I can’t wait for the course – we South Africans have a wonderful opportunity to reach out to each other through language and I think it’s long overdue! I love the Maq advert on TV – come on Africans of all colours, let’s embrace this great nation of ours and ALL her languages! This is absolutely brilliant -thank you. Yes, Im sure you will have no problems adjusting. I’d love to learn Xhosa as it is such a poetic language. He problem though is that I live in London. Can I get access to the materials here? For sure, Graham. The free online course can email to anywhere and the materials on sale in the shop are downloadable from anywhere. Thanks for this awesome service!! Wow! What a great Idea. I’m looking forward to joining an online class. I love Xhosa language. This is going to be great – can’t wait to start. Thank you so much. A pleasure, Carmen, hope its going well?! Thank you this is great! after marrying a South African (though we currently live in the uk ) I fell in love with the county and all its people, such spirit that I have not seen anywhere else. I am currently learning Afrikaans and wanted to learn another African language as I really want to feel part of this wonderful country, and I think that comes from making the effort to converse with people in their language. 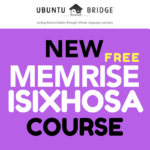 I am extremely excited to get started with this free online xhosa course! We are going to learn together as a family and that way have the ability to practice speaking and helping each other! Thank you so much for making this available for free! Hope its been going well, Roche! Thanks so much for this awesome initiative bru.. Can’t wait to be able to try out my new linguistics in the taxi..
Hi Ubuntu sorry for that language I used before . But how I learn Xhosa in 3 days . Sorry to hear. Some people seem to experience a glitch, but you just need to click the confirmation link. If the next email is not immediate you need to try again, or re-subscribe. Hope it is working for you! You know how sometimes you are just drawn to a certain area or people…no matter what you do, you find things leading back to them? Well that’s how I feel about South Africa and it’s people. I’m incredibly drawn to SA. So, I find myself here. I’ve gained some close friends (who are more like family) that live in SA and so…I find myself here. Majority of them speak either Xhosa, Zulu or Sotho. My desire is to learn all 3. I’m starting with Xhosa. I’ve searched and searched and this seems like the right place! These friends/family of mines are in the Soweto Gospel Choir. They’ll be back here in the U.S. from October to December. I’d like to be able to hold a conversation in either of those languages. They’re all teaching me, but its kind of difficult lol. They say things to me and then tell me to go figure it out lol. So any help you could provide would be most appreciated! Thanks for what you’re doing here. If no one else appreciates it…I CERTAINLY DO! Hi Andrea, that is awesome! isiXhosa and isiZulu are similar, so learning the one is a really good foundation. Sesotho is another kettle of fish, but my aim is to create a free one for this Mandela day coming up! I am so excited to do the free Xhosa course. My boyfriends mother tongue is Xhosa and i want to suprise him. Nice I hope it goes well!! 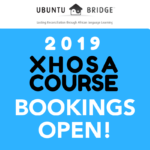 Been wanting to learn Xhosa for absolutely years and something sparked a search today….what an amazing offer, cannot wait and hoping my language learning skills are up to scratch! Looking forward to starting this course! It’s really needed. Thank you! I hope there is lots of audio to go along with the course material. I would like to be able to start off nicely and in the end be fluent in Xhosa. For me, hearing and repeating, but also knowing what I am repeating will be very helpful. The audio is the strongest part, with spaces for you to guess the answer after the English and before you hear it in isiXhosa and then repeat it after each time you hear it in isiXhosa. They are great materials. The written parts are good to complement the audio so that you can hear what is being said, and they mirror each other, so do look at the manuals, but the audio alone have all the explanations and teachings and are the crucial part!! I am an Afrikaans/English half-breed girl, living in Kazakhstan, where people speak exclusively Russian and Kazakh, but I am learning IsiXhosa. This all makes sense in my head. I am coming back to SA because let’s face it: Kazakhstan isn’t the place we have all dreamt to move to one day. And I know you are burning to ask, and my answer is yes, I have seen Borat. I hope its been awesome. So excited to start learning this language. Hi, I am very excited to start this Xhosa language course. I am a medical student and learning an African language is invaluable in terms of communication with our patients. Thank you for this opportunity! Keep up the good work! Looking forward to it all. I so love this language and it’s people. Hi. I recently subscribed for the lessons but I have not recieved the confirmation email yet. Ndenze njani? Awesome idea! Do you guys know about Duolingo? They have a free platform for building free language courses (https://incubator.duolingo.com/). And they have a version specially designed for school setups. Just thinking that it would be wonderful if high quality Xhosa lessons could be available for free to schools. Eventually even more languages! Yeah i loved using Duolingo for German. It would be a wonderful thing, but Im running on empty for projects I can keep doing for free. I am excited to get started! All of this seems so fun and everyone is inviting. Hi, a friend and I both subscribed to the beginner xhosa course yesterday and haven’t received any confirmation emails. Her email addie is u.a.r.kelly@gmail.com and mine katechi2014@gmail.com. please help! Thank you for this opportunity guys! Looking forward to getting going! I registered for the free course but haven’t received any course material. PLEASE NOTE: Due to demand, and problems with Graphicmail, the service we use for our triggered emails, many people are not receiving any or all of the emails. It’s been driving us crazy and we wish to upgrade the service to Mailchimp, which is unfortunately far more expensive. This may take a little while, but if you remain subscribed we will email everyone and update you when the new course is ready! Apologies and thanks! Hi there, I signed up earlier today but have not received any emails. Checked my spam folder, nothing. Hi, Amy, It’s taking some time for us to get funding for the shift to a new system, but it will happen soon and all subscribed will receive the announcement! Apologies! hey its a bit late now so tomorrow im gonna subscribe and learn .thanx for wat you do it means alot esspecially when your parents forget to teach you your own language and make a 15 year old feel alienated from his roots. Thanks for this great initiative. I have been doing some work in the English literacy space and feel I would connect so much better with my students and their families if I could step across the language divide, even in a small way to show some respect and connect a bit more to where they are at. Looking forward to starting the course. Will let you know if I have any technical difficulties. I am a resident here for 41 years and have employed a lot of Xhosa guys from Walmer Township, its about time I learnt their language a they know mine, I am 75 years old. Wow! I am humbled by your vision, passion, insight, skill, eloquence and articulated commitment! And look forward to learn, immerse, grow and add to peace, hope, collaboration and great joy and healing. and might be able to connect with sponsors or discover with you how I might be able to help establish relevant decision making connection. Nkosi, dankie – may this, my commitment to learn and grow, be the beginning of a little garden of great and wholesome potential. Hi, thank you very much for the free online course. I am looking forward to the lessons to have a proper conversation with my in-laws and the special person in my life. Great news, Ingrid, all the best! Thanks for the hard work that goes into this! I am stoked to start learning. After living in Korea and learning the language here, I figured it is a shame that I don’t speak more SA languages. Too bad I had to live in Asia to realize how much learning a language can mean to yourself and to others. Looking forward to start learning and even more so to moving back home and practice! Baie dankie vir die harde werk! Welcome back and happy learning! I have tried so many times and this is the first time things are actually tweaking! Thanks so much. Ndiyabulela. You are making us happy!!! Siyabulela nathi! I have signed up for the free lessons twice now and no luck! sorry to just see this! Come right yet? Congratulations for offering isiXhosa language classes online. I am from Tanzania. From mi-Jan next year I will be interning at the Philisa Abafazi Bethu Women and Children’s Program in Capetown after completing my course in counseling psychology. Learning isiXhosa ahead of time will help me a lot to give my best while there. It will also be interesting to see how different it is from Swahili my mother tongue. I can’t wait to learn as much as I can, both the language and the culture because that will come in handy during my stay. Asante sana (means ‘Thank you very much’ in Swahili). Thanks for this Gift that you are giving all of us. Tell me more at what point you are struggling? Click the link in the email. It will take you to an archived newsletter with a link, and the password to enter. That should work! Can you recommend an advanced course after completing this? Do you mean video online or in person? We naturally recommend our materials levels 1-3 or our public courses! Im super excited to start the course and have been mistaken so many times as a someone who can speak isixhosa because of the way I always wear my doek and I always have to stop the person in the middle of their sentence to tell them that I dont understand and they are always in disbelieve and I have asked so many to teach me but it never worked.. and then I saw u guys… my luck has changed!! Hoping for great things.. thankq for the chance!!! So happy to hear it, Faith! Hi! I am really excited to start this course but have not received any email after the “Please confirm subscription” email and clicking it. Hi Renaldo, I believe you are sorted, but its vital people check their spam or junk, archive or other folders, and ideally whitelist our email address “sales at learn xhosa dot co dot za”. The first email is immediate and the rest are every few days! Enjoy! Thank you so much for offering us with an online classes I also need to learn isixhosa proper..
Great Nokubonga, hope it is going well? Hey Guys. I am able to subscribe to the program but however I am not receiving my lessons or videos after subscribing. Any assistance in this regard please? Andrea, I believe you are sorted, but its vital people check their spam or junk, archive or other folders, and ideally whitelist our email address. Please can u talk me where to find a private Xhosa teacher in London ? Hi Helen, For what level? Email bookings at learnxhosa dot coza and I can forward you to some online tutors? Ewe uzoyifumana kwiLink phakathi kwi-email! I was wondering if you guys still do private lessons with whatsapp? Will update you on email. Please do subscribe for updates! I suscribed to your free online Xhosa course, but never received the email tgat was supposedly sent to me. Leave a Reply to Morne Strydom Click here to cancel reply.